SICK Pte Ltd Singapore was founded on 28th June 1991 as a wholly owned subsidiary of SICK AG, Germany. 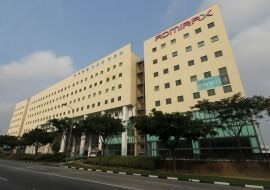 Our present office is located in Sembawang in Northern part of Singapore and boasts of 101 employees in SICK South East Asia offices in the region including Sales & Service, Regional Product Center, and Regional Competence Center. The regional sales office & service center for ASEAN (Association of South East Asia Nations) support all the products and services for SICK. These countries include Vietnam, Malaysia, Thailand, Philippines, Indonesia and Singapore. Regional Competence Center provides advanced level application support for systems and vision business to subsidiaries in Asia Pacific Region. Our services include Application Engineering, Product Technical Support, Sales & Service, Order processing, R&D, Manufacturing, Product Management, Human Resource Management, Finance & Controlling, Information Technology, Facility Management & general administration. SICK established a Regional Product Center(RPC) in Singapore in 2009 to better support the needs for smart sensor solutions from our customers, particularly in the Asian region. Consisting of the R&D Center in Singapore with a Manufacturing Plant in Johor, Malaysia, Sick RPC focuses on developing new innovative sensors which provide ingenious solutions to solve automation problem our customers face. With close proximity to customers in Asia and having deep competence and know-how for Sensor Innovation in the field of optical electronic, inductive and magnetic, RFID and laser sensing for industrial and logistic application, Sick RPC is well positioned to meet customers requirement with quality and timely delivery.